The trip to North Sumatra was one of my personal favorite so far. Dense jungles, sky of the bluest hue, dreamy colonial towns up above the hills, thousands of sparkling stars, and a lake so beautiful that will leave you at a loss for words. It definitely felt like I have traveled through a few countries within a week. Despite all the warnings, I did not feel threatened at all being in this part of Indonesia. I've met some of the nicest people who have offered me the warmest hospitality during my stay. Although at least ten men tried to get me to marry them or their sons, the people here are genuinely good-natured. I definitely felt a lot safer here than in Cambodia, where I was constantly harassed almost everywhere that I go. The map below shows the places that I initially planned on going. 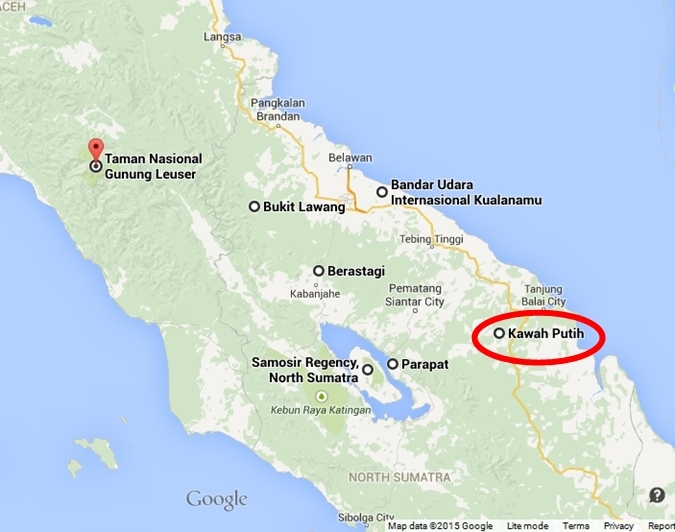 I couldn't make it to Kawah Putih as it is on an entirely different direction. Aceh on the far north was out of the question since I only had a week. I have also left Tangkahan out (a place famous for its elephants) because there is no way I am paying €95 to ride an elephant for an hour or €70 to wash an elephant. People in the tourism industry should really learn how to price their services reasonably. Since I travel alone, I always make sure that everything has been thoroughly planned out before I set forth. For that to happen, I've contacted a few people (a few locals and a few foreigners who have been living there for years) to help me out. Thanks Pamela, An, Syaiful, Adin, Martinus, and Tazkia! Since I only had a week to spend, I unfortunately had to rush through most of the places. It is recommended to spend at least three days in Bukit Lawang and do the 2-day jungle trekking in Gunung Leuser. There is nothing much to see in Berastagi so two days is just right. Medan, the capital of North Sumatra surprisingly lacks of worthy attractions and landmarks so a lengthy stay is not advisable. For detailed itinerary and complete information on which public transportation to take when getting around North Sumatra, follow me on Google+ or Rolling Grace's 1-day old Facebook page to receive the latest updates! What is your best suggested itinerary to visit?